Want to know about one of my favorite new poetry titles, as we land here today smack dab in the middle of National Poetry Month? 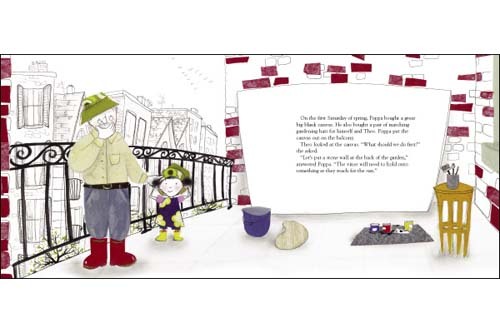 Well, I’m going to tell you, as well as show you art from another new picture book title I love (non-poetry, that is). This is the opening poem from Lee Bennett Hopkins’ new picture book poetry collection, City I Love, illustrated by Marcellus Hall and released by Abrams Books for Young Readers this month. 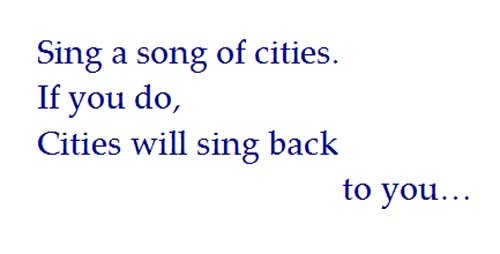 This is a collection of eighteen poems from Hopkins, poems serving as a tribute to the big cities of the world and everything that makes them pop, celebrating the diversity of city life. Hall, whose debut work illustrating a children’s title I evidently missed last year (but just promptly requested from the library), has created art work for many newspapers and magazines, including the New York Times, the New Yorker, and Time. In this title, he takes us to specific locales all over the world with his detailed and almost sparkling watercolor cartoons (Tokyo in “City Lights,” Moscow in “Winter,” and New Orleans in the haiku, “Sparrow,” to name but three). The visual thread holding the poems together is the dog-bluebird duo travelling the world in Hopkins’ poems, which range from contemplative to jubilant. The endpapers are composed of world maps, noting the cities which the dog and his companion travel. Map-lovers just might squeal. I love this book. Young—and old—travellers alike will be delighted. Poppa and Theo continue with the planting of their garden, so to speak, mixing paints and painting tiny stems, the first blooms in crocuses, and a tiny robin, who “has come to visit our garden,” Poppa tells her. When Poppa goes away on holiday (no euphemisms or hidden symbolism there, despite his age; he’s simply a hip world-traveller, it seems), it’s up to Theo to continue to “tend” to the garden. Paintbrush in hand, she’s ready for the task. 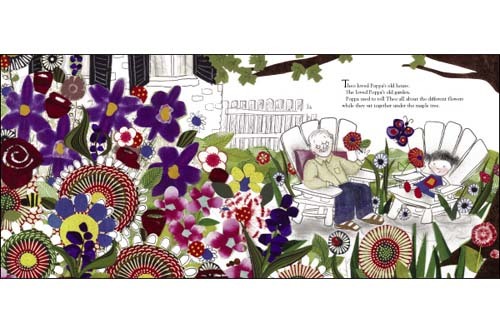 I love Larsen’s story, its celebration of the rich imagination of children, and I love Luxbacher’s art here, rendered in pen and ink and multimedia collage. It’s an absolute feast for the eyes, with her generous—but well-composed and not too overwhelming—splashes of brilliant color. (The forget-me-not spread, “Poppa’s favorite flower,” puts the pop in eye-popping.) I hope that Luxbacher, who also teaches art, does even more children’s books. Here’s a random piece of art from her portfolio. See? 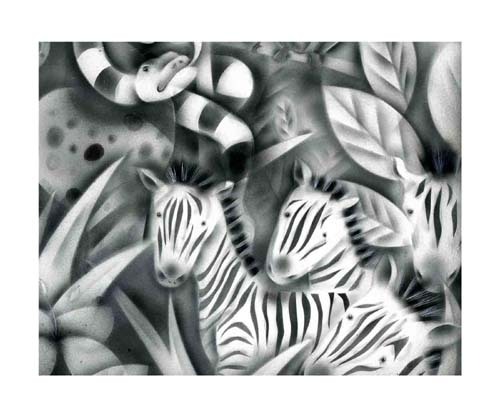 Don’t you want to know the story behind those zebras? And that snake. 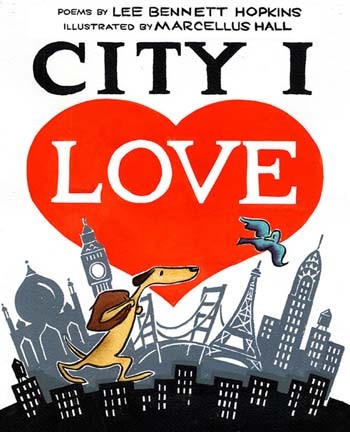 CITY I LOVE © 2009 Lee Bennett Hopkins, illustration © 2009 by Marcellus Hall. Published by Abrams Books for Young Readers, New York, New York. Posted with permission of publisher. All rights reserved. 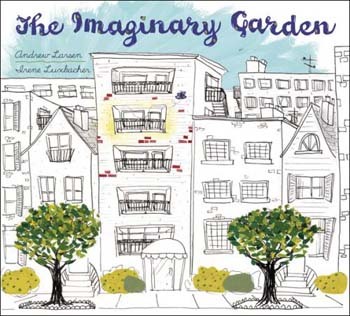 Selections from The Imaginary Garden by Andrew Larsen and illustrated by Irene Luxbacher. Illustrations and text © 2009. Zebra image also from publisher. All rights reserved. Well, THIS is a visual feast. I was all set to be excited about just the first one — because the poetry really IS fabulous and I love the illustrations and the fact that they’re not all American cities but places all over where the bird and dog go — but then the flowers — really the colors do SING out and illuminate the sketches in The Imaginary Garden. What a lovely pair. Good call – Marcellus Hall’s art really does have a healthy hint of Sid Hoff to it. I love the unusual perspectives. Very cool indeed, J.
Oh — I must get my hands on these two books! Thank you for drawing our attention to them. 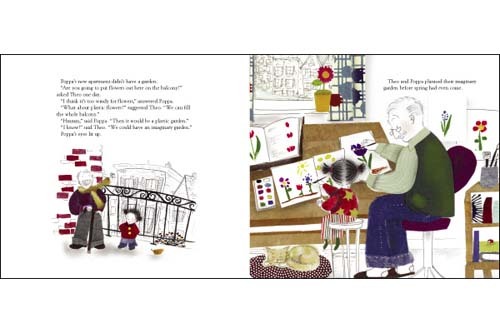 The Imaginary Garden especially calls out to me, not just for the artwork, but for the wonderful text. Nifty stuff. Those zebras are fantastic. What beautifully varied and inspiring cities and gardens. Thanks for another soul-replenishing offering! Loved the Dylan Thomas poem, too, which is a lot like reading Genisis itself in its primal richness.